You don’t have to give up a colorful, funny, or attractive design for the function of a top-notch travel mug. Zazzle’s commuter mugs feature a rubber-lined lid for a tight, spill-resistant seal. Just twist the lid to reveal the sip opening. 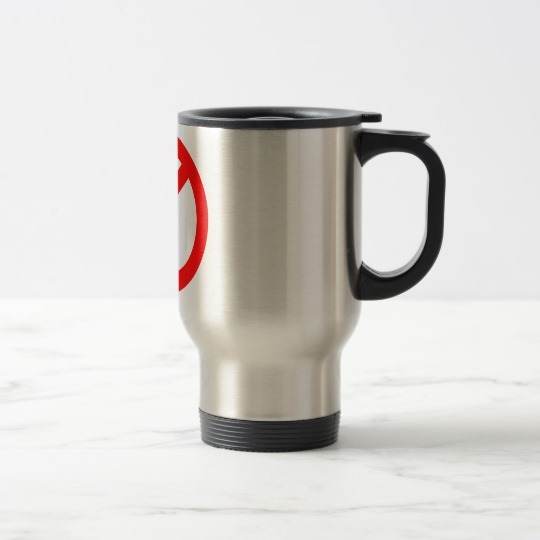 Our travel mugs are made of double-walled stainless steel that will keep your coffee piping hot through a busy morning or long commute. They are not only durable, but are also easy to clean. Your design will be printed on demand by our team in San José, California. Dimension: 6.2” high x 3.5” diameter. Do not microwave (product made of metal); Hand wash recommended. Stainless steel body; Plastic handle and base; Rubber-lined plastic lid. Brushed steel or white color options (white mug is stainless steel coated with a white glaze). Volume discounts start at 25 mugs – click the quantity dropdown menu to learn more. A hipster face with curly mustache, big hipsters beard, horn rimmed glasses and man bun. 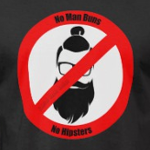 The hipster's face is covered with the no symbol with white in the background. The top of the anti man-bun design has the words: No Man Buns. No hipsters is spelled out at the bottom of the design.